From the 9th to the 11th of January, 2019, all participants in the Empowering Dance project gathered for the first time to exchange about approaches and experiences, as well as to begin to identify and reflect on the soft skills arising in contemporary dance practices. The aim was to shape the pathway needed to make more visible what contributes to soft skills within each of the case studies, as well as to collectively define our areas of focus. The first day involved introductions and a working session engaging with both physical tasks and reflection rounds, triggered by a few impulse questions sent the day before: When you’re teaching dance or leading a workshop, outside of “steps” or movements, what else are you teaching? What is most important for you to transmit about your practice? Through what non-verbal layers in your practice are you fostering relationships with others? A first collection of thoughts following the physical tasks and written on a large sheet of paper spread across the studio floor already revealed soft skills at play: negotiation, focus, responsibility, trust, respect, awareness of time, connection, as well as how a physical practice can help open up new ways to investigate a topic or theme. Through a few shared stories from the dance artists in the project, we could zoom in further: A physical practice activates the senses anew and helps people shift into the unknown. Tasks utilizing touch and contact help create that shift. Additionally, attention is often given within contemporary dance practices to remove hierarchy and to meet on equal ground. The second day contained a presentation from project researcher Luisella Carnelli, where she introduced the European Qualifications Framework and explained that personal, social and learning competences are also sometimes identified as life skills, socio-emotional skills or transversal skills, in addition to being identified as soft skills. Luisella Carnelli also gave a first impression of the soft skills contained inside of the dance practices in the form of a map, which she identified through interviews with the project participants. 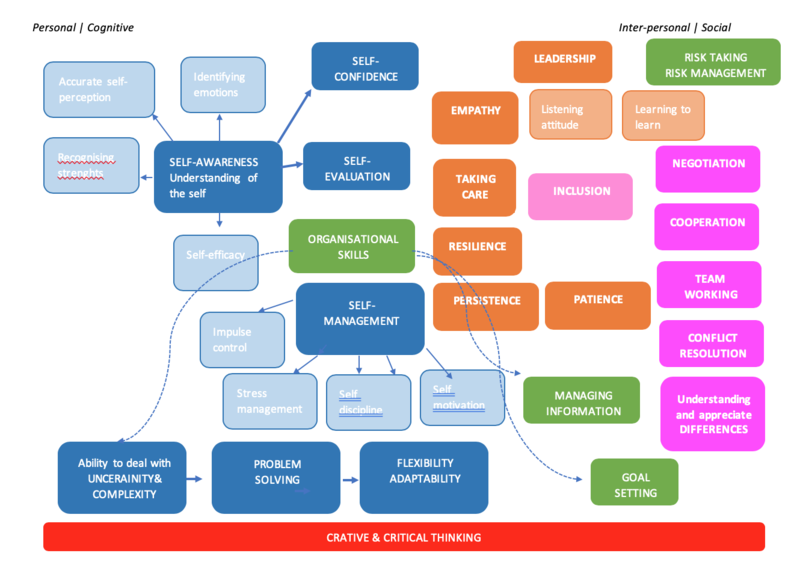 The map lays out specific personal and cognitive skills next to interpersonal and social skills, which all fuel creativity and critical thinking. The map triggered further impressions regarding what is happening in the duration of the dance practices: the movement one makes from a physical dimension to a creative one, as well as the movement from the personal to the social; a moving body helps to interrupt one’s thinking patterns and norms; the way a dance practice navigates through fear and opens up sensations of freedom; how various artistic dance practices give meaning to bodily experiences; the valuing of body knowledge as a pathway to new understanding and discoveries. A highlight of the afternoon was meeting three former long-time members of the K3 Youth Club for teenagers and young adults interested in contemporary dance. While they could not yet specifically name how their dance experiences contributed to attaining soft skills, the descriptions of their time in the Youth Club gave some clues. They described an ongoing process of dealing with oneself and one’s own body in relationship to others, activating a new awareness in how they “read” people and the act of encountering something unknown and the ability to figure it out via their acquired physical skills. While in her university studies, one participant said she didn’t shut off her brain when she came to the Youth Club, but rather came to use her brain in a different way, which ultimately helped her learn more effectively at university. The day concluded with addressing the administrative and coordination needs of the project.